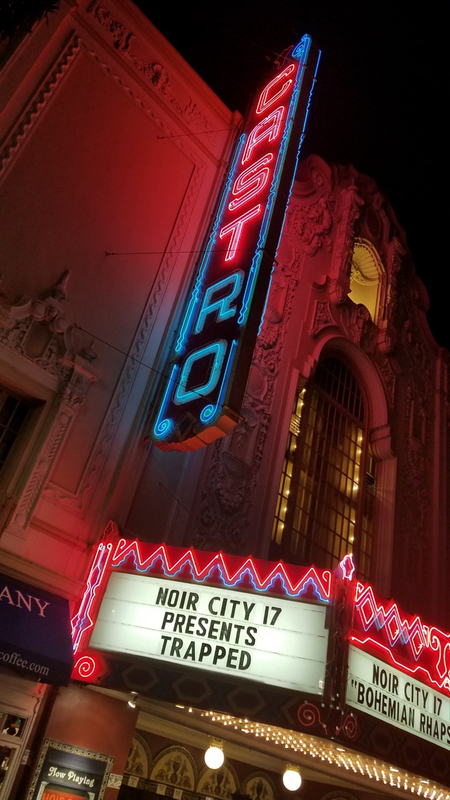 Trapped, a nearly lost movie from 1949 which was restored last year thanks to a grant from the Hollywood Foreign Press Association, was the featured presentation at the opening night of Noir City 17, the annual festival sponsored by the Film Noir Foundation. The historic Castro movie theater in San Francisco was again the venue. The venerable movie palace sold out its 1400 seats for the opening night of "A ten days feast of danger, desire and despair" in the words of Eddie Muller, "The Czar of Noir", who is the producer and host. It is "an excursion through Hollywood's only organic artistic movement. .A festival in which murder, betrayal, and deceit bring people together to blissfully commune in their shared passion for film noir". Trapped fills the bill perfectly. It is a tale of betrayal and deceit, reflecting the zeitgeist between the end of World War II and the start of the Korean Conflict when the popular heroes were not the military but the law enforcers- the FBI, the Secret Service and the T-Men, the anti-counterfeiting investigative arm of the Treasury Department. In this film, as the T-Men investigate a flood of phony notes, they release a convicted counterfeiter, played by Lloyd Bridges, to use him as an undercover operative. But he is stringing the Feds along, while he scores again and flees to Mexico with his hot girlfriend, played by Barbara Payton. In Muller's words: "The double and triple crosses come fast and furious, as no one's sure who's a crook and who's a copper"
Actor Lloyd Bridges, father of Golden Globe-winning actors Beau and Jeff, was a bit player in theater and film before the war. "I didn't have enough maturity for a leading man." he said." I looked too much like a kid. In (the) Columbia (studio) all the best roles went to Glenn Ford and William Holden. They just put me in these awful B-pictures. Sometimes I'd be in two or three movies a week. It was tough sledding" But when Bridges came back from the war, he got leading roles: He played lawmen in Secret Agent 9-X (1945), Secret Service Investigator (1948), and a year later he switched sides to play a convicted felon in Trapped. Trapped was one of the first features directed by Richard Fleischer, who later became an A-listed Hollywood director, lensing blockbusters from Tora Tora Tora (1970) to the colorful Doctor Doolittle (1967), nominated for five Golden Globes including Best Motion Picture-Comedy or Musical. 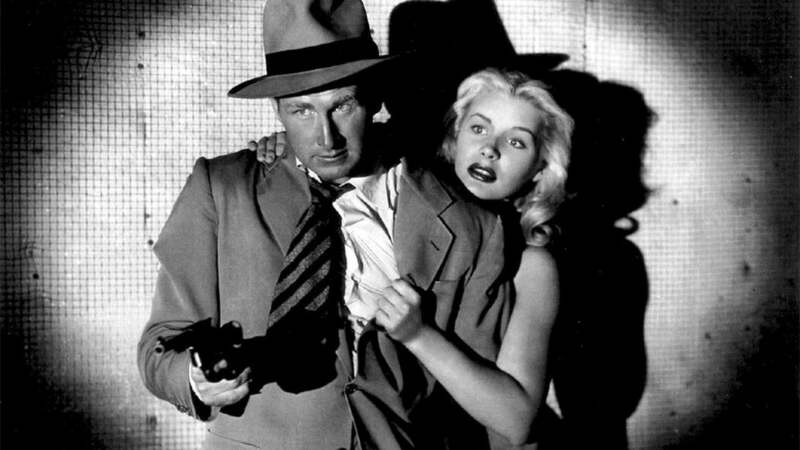 Lloyd Bridges and Barbara Payton in a scene from Trapped, dir. Richard Fleischer, 1949. Trapped was one of several noir movies that Fleischer directed in the 1950s. Produced by Eagle-Lion Films, a minor studio, its negatives and prints were neglected, and the movie was considered lost. A search for 35mm elements in 2015 was futile, and when the HFPA gave the Film Noir Foundation a grant, the plan was to restore digitally from a lone known 16mm print. But at the last moment, an "impeccable" 35mm print was found at the Harvard Film Archive in Cambridge, Mass. It was lent to the UCLA Film & Television Archives' restoration lab, and the work was done in time for the opening of Noir City 17, at the end of January. HFPA Board member Yoram Kahana represented the Association at the event and delivered a commemorative plaque to the FNF founder and president, Eddie Muller. Kahana told the audience that the HFPA is committed to keep working with the FNF, as film restoration is becoming an important part of the HFPA grant program, evidenced by the recent $250,000 grant to the Lyon Lumière restoration festival and $100,000 to the Bologna restoration festival. A deeply moved Muller said: "The Hollywood Foreign Press Association's Charitable Trust is the single most valuable ally the Film Noir Foundation has, in its continuing efforts to raise funds to rescue and restore significant films that would otherwise be lost to time and obscurity. We cannot thank them enough." The packed house erupted in cheers, and moments later cheered again when a full-screen credit appeared at the beginning of the screening, thanking the HFPA. When told about the restoration, Jeff Bridges, Lloyd's actor son who's the most recent recipient of the HFPA's highest honor, the Cecil B. deMille award, wrote to say how pleased he was: ”I love seeing these old movies of my dad’s. He made Trapped the same year that I was born!. This one is a favorite." Trapped will be released on Blu-ray and DVD by Flicker Alley, joining other HFPA/FNF collaborations, restored versions of Woman on the Run (1950), Too Late for Tears (1949). The next film to be restored by the FNF with an HFPA grant- the Argentinian noir Los tallos amargos/ The Bitter Stems (1956). Trapped will be shown across the nation as part of this year's Noir City 17 festival circuit in eight cities from coast to coast, starting in Los Angeles, at the Egyptian Theater, March 29- April 7, 2019, where the HFPA funded restoration will again anchor the opening night.